Everybody uses computers today. They have become a part and parcel of human life. We see computers everywhere, be it banks, airports, railway counters, supermarkets, cinema theatre, industries, schools and college. In fact, we cannot image a life without computers. It would be interesting to know the history and evolution of this great invention that has forever changed the way we live and interact with people. Charles Babbage is known as “Father of Computers”. In 1822, he conceived an idea of developing a ‘difference engine’ that calculated polynomials using numerical methods. 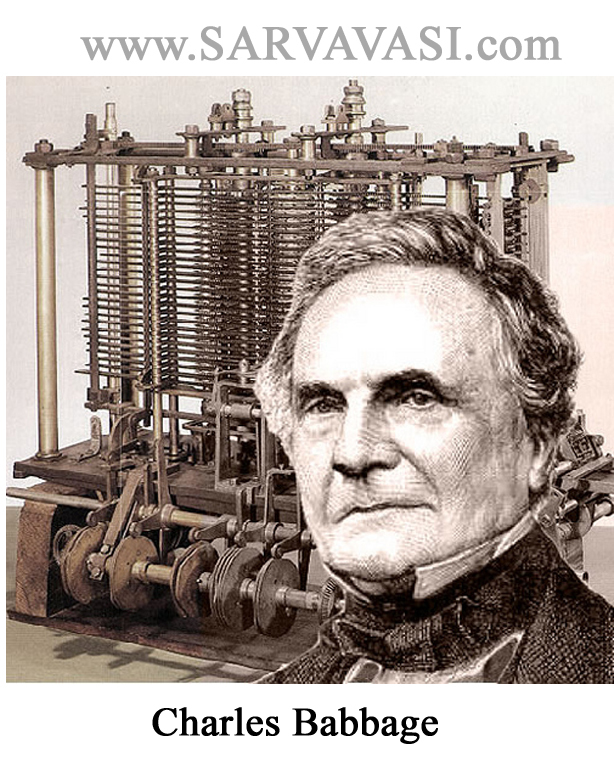 Between 1833 and 1842, he tried to build a machine that would do any calculation based on a program fed to it. This machine was called ‘analytical engine’. This engine contained two parts: mill and the store. The mill used to execute operations and is similar to the CPU (Central Processing Unit) we find these days. The store contained data on which the operations were performed by the mill. So, the mill was similar to the memory unit of today’s computers. The analytical engine forms the basis of the development of modern computers. Charles Babbage, the father of the computer. Today’s computers have a long history and have undergone revolutionary changes since their inception in the 19th century. Whenever there was a major change in the software and hardware, it completely changed the way the computers worked. Such a change or landmark is called a ‘computer generation’. There are five generations of computers. In each generation, there is reduction in the size of the computer and an enhancement its efficiency. The computers of the first generations did not use any operating system for their functioning. Programs were written using machine language instructions. This basically means the program used the binary digits 0’s and 1’s.The computers are constructed using vacuum tubes and therefore they occupied a lot of space, often as much as a big room. Magnetic drums were used for storing data. Input to the computers was given using punched cards and paper tapes, and the output was printed on paper. First generation computers could perform only one operation at a time. The First general purpose digital computer, named ENIAC (Electronic Numerical Integrator and Calculator), and was built in 1946. Occupying 1250 square feet, It used 18,000 vacuum tubes and weighed 30 tons. The first commercial computers UNIVAC (UNIVersal Automatic Computer) was built in 1951. In second generation computers, vacuum tubes were replaced by transistors. As a single transistor can replace several vacuum tubes, second generation computers became smaller in size. Programming was done using done using small English words called mnemonics. For example, to perform addition, the ADD instruction was used. Similarly, to perform subtraction, the SUB instruction was used. Such type of language is called ‘assembly Language’. Writing programs in assembly language is easier than in machine language. Even though assembly language was used in second generation computers, the early versions of COBOL (Common Business Oriented Language) and FORTRAN (Formula Translation) were also developed during this time. Second-Generation computers stored instructions in the memory by using magnetic core technology. Punched cards were still used to feed instructions to the computers. Some examples of Second generation computers are PDP-8 and CDC 1604. The invention of IC (Integrated Circuit) led to the development of the third generation of computers.IC refers to an electronics circuit infused into a semiconductor material like silicon or germanium. An IC is also called a chip, and a single chip can do the work of several transistors. ICs helped to reduce the size of computers so that they could be comfortably placed on a table. In addition, the speed of computers increased significantly .More ever computers began to be manufactured commercially for the general public. Third generation computers used operating systems like UNIX for their functioning. Keyboards were introduced to enter data, and monitors to display the results. High-level languages like BASIC (Beginners All-Purpose Symbolic Instruction Code), Pascal, COBOL and FORTRAN were used for writing programs. The IBM 360 series and Honeywell 6000 Series are example of third generation computers. The introduction of the microprocessor, which took the place of chips led to the development of the fourth Generation of computers. A single microprocessor contains thousands of chips and is very small in size.Hence, the sizes of these computers were very small and could easily fit the palm of your hand. The first Microprocessor, 4004, was developed in 1971 by Intel Corporation. This processor contained a CPU, Memory and controlling input and output devices. In 1980, DOS (Disk Operating System) was introduced by Microsoft Corporation. In the 1990’s, the windows operating system was developed. In addition, Tex was developed to access database and SQL (Structured Query Language) for formatting the text. Moreover, the programming (OOP) Language like C++, Java and .NET were also developed during this period. Fourth-Generation computers are connected with cables, leading to the development of networks. The biggest network in the world, formed by billions of computers, is the Internet.IBM (International Business Machines) introduced its first computer for users at home in 1981. Desktops, palmtops, laptops and PDAs (Personal Digital Assistant) are all fourth-generation computers. These computers were able to perform many tasks at a time. Parallel processing is employed in fifth-generation computers. In these computers, several processors work together and process data and instructions simultaneously. This in turn would increase the speed of these computers. The processors are created by using ULSI (Ultra Large Scale Integration) technology. Intel’s Pentium 4 processor, for example, has 55 million transistors. The concepts like virtual reality, voice recognition, artificial intelligence, and robotics have led to the development of fifth-generation computers. A lot of research is currently underway to intelligent computers that can think and behave like humans. This means equipping computers with artificial intelligence, a term first coined by John McCarthy.The Japanese call these computer systems KIPS(Knowledge information processing Systems) , where the computers would be capable of automatically producing answers to queries given in natural languages.